There is no other habitat like this in the whole world – tides bring the salty sea water 6 km far into the enormous passages of Puerto Princesa Subterranean River. Passages of this giant underworld are more than 24 km long and here is located one of the largest cave halls in the world – Italian’s Chamber. Palawan is spectacular island – but the small (roughly 35 km²) Saint Paul Mountain Range might be the most spectacular place in this beautiful island. These mountains have been formed from a dark grey limestone, which has formed in the Late Oligocene – Early Miocene – some 16 – 20 million years ago. The highest summit is the 1,027 m tall Mount Saint Paul. The thick layer of limestone is dissolved by the torrential rains, characteristic for the wet climate of the western Palawan. Intense karst processes have created dramatic landscape with countless sharp limestone pinnacles, domes, sinkholes, shafts and – impressive caves. Since the ancient times the local Batak people knew about the existance of large underground river in these rugged mountains. This river could be entered by… boats directly from the sea. Batak people believed that in the cave lives an evil spirit and were afraid to enter it. In written sources the cave was first mentioned in 1887 by a scientist from the University of Michigan – Dean C. Worcester. Intense research of the karst region in Saint Paul Mountains has taken place over the last decades by expeditions from Australia, Italy, Germany, some other countries and, of course, Philippines. Researchers have mapped more than 24 kilometres of passages in the cave and collected rich material of the unique cave fauna. As the small stream – Cabayugan River – reaches the limestone of Saint Paul massif, it disappears underground. In this place river is just 30 m above the sea level, although the sea is 6 km from here (direct line) and Saint Paul Mountains are in between. 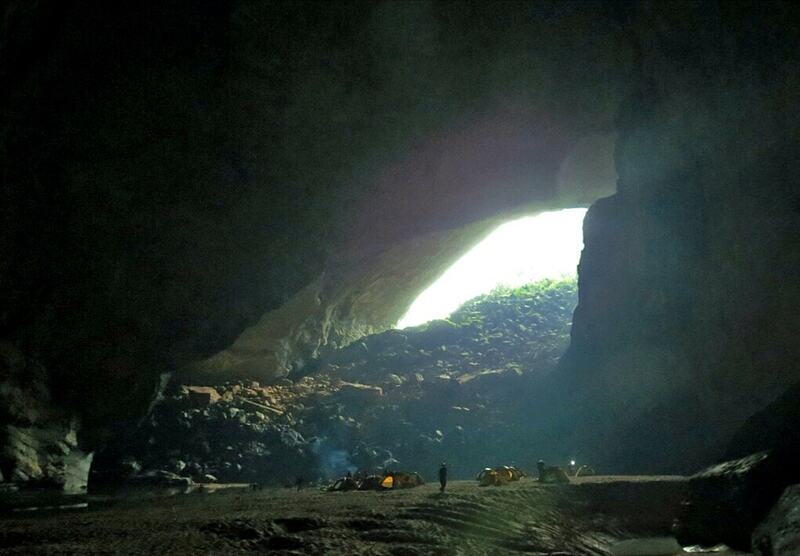 The beginning of the cave – called Daylight Hole – is very impressive. It starts with 60 m high, 100 m wide entrance hall, which becomes narrower only after 200 m.
Cabayugan river flows 8.2 km under the ground, until it reaches the sea. The stream is rather slow and smooth, in spite of the dramatic mountains rising above it. Subterranean river passes the 1,027 m high Mount Saint Paul just few hundred metres west from its summit. River is up to 8 m deep and can be accessed with a boat 4.2 km far from the sea – it is the longest underground river in the world which can be travelled with a common boat. The height of the tides in this region is approximately 1 m. This tide wave goes… 6 km deep in the cave! As a result here has formed the largest known subterranean estuary in the world. This is unique habitat with a brackish water, rich with diverse creatures living in it. Ecological research of this biotope is ongoing (e.g. by Dr. Hendrik Freitag). 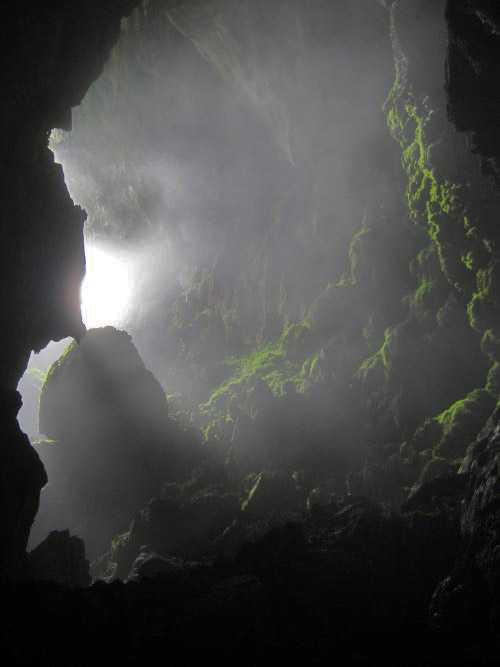 In 2007 – 2008 Italian speleologists from explorer’s group "La Venta" discovered in Puerto Princesa Subterranean cave one of the largest cave chambers in the world, which was named – Italian’s Chamber. This hall is 360 m long, up to 140 m wide and 80 m high. The estimated volume of it is approximately 2.5 million m³. Besides the main, active passage with Cabyuagan River in it there are several more branches, which, for the most part, have formed in earlier times. The cave can be entered through several of these passages and during torrential rains here can form smaller cave streams – tributaries to Cabayugan River. 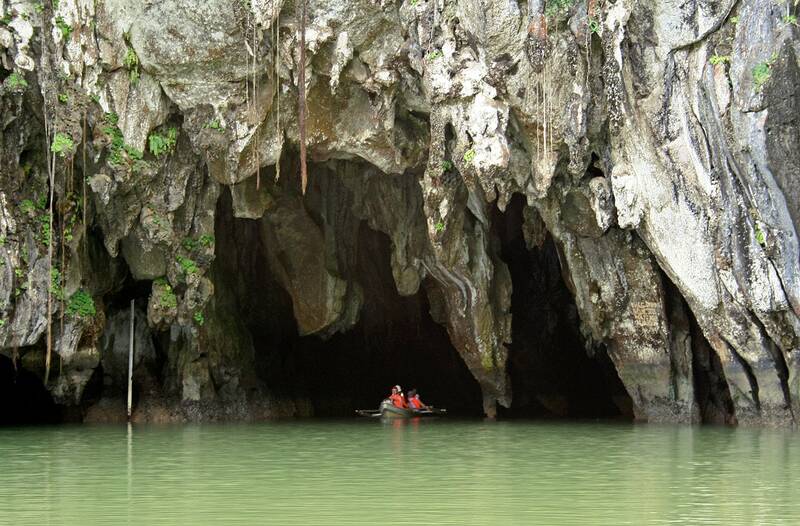 Enormous cave which can be entered with a boat from the sea – this is a dream come true for tourism industry. 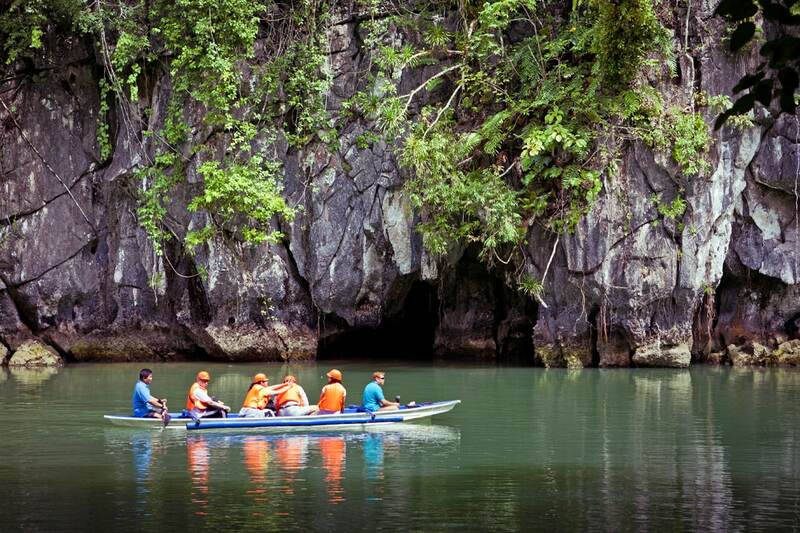 Authorities of Palawan and – whole Philippines – is promoting the beautiful Puerto Princesa Subterranean River. Arrival to this rather remote area takes time and money. Best time to visit is January – May, when the sea is more calm and weather – more sunny. Tourists, approaching the cave, first are amazed by the dramatic seaside cliffs which are covered with lush vegetation. Boats enter a smaller estuary and opens a sight to the cave. Tourist boats are allowed 1.2 km deep in the cave. Amazed guests look at countless beautiful and enormous speleothems – stalactites, stalagmites and other formations. People did not develop intense agriculture in this rugged landscape – and as a result in Saint Paul Mountain Range has been preserved a patch of the pristine Palawan Moist Forest. This is one of the best preserved natural ecosystems not only in Palawan but also in the whole Philippines. Forest is extremely rich with plant life and also – with animal life. 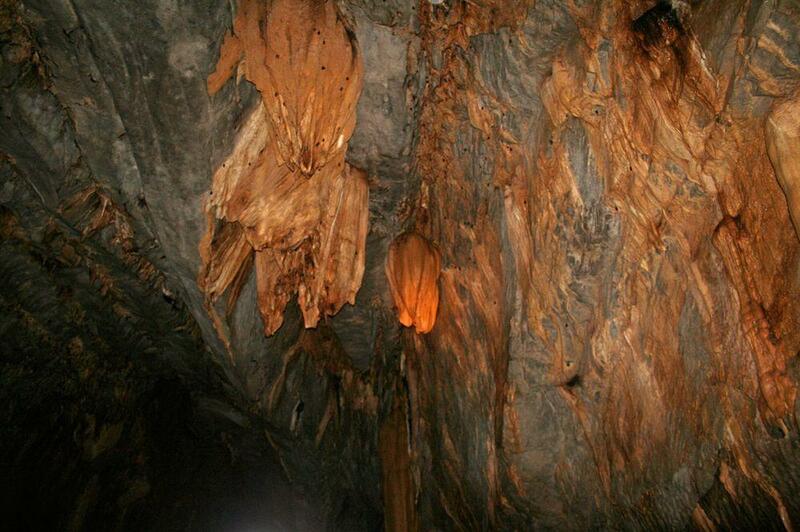 Additional value is the rich cave fauna – in Puerto Princesa Subterranean Cave live many thousands of bats and swiftlets. Besides the main cave here are known many other caves, some more than 1 km long. The 650 m long Nagbituka I Cave has 40 m high waterfall inside. In the sea discharge several more powerful submarine discharges. 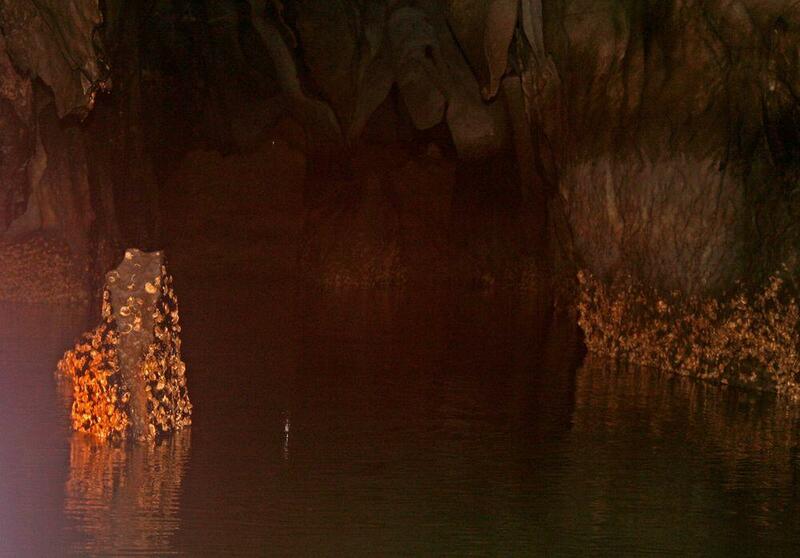 In 1971 here was established a national park – Puerto-Princesa Subterranean River National Park. In 1999 it was included in the UNESCO World Heritage List. 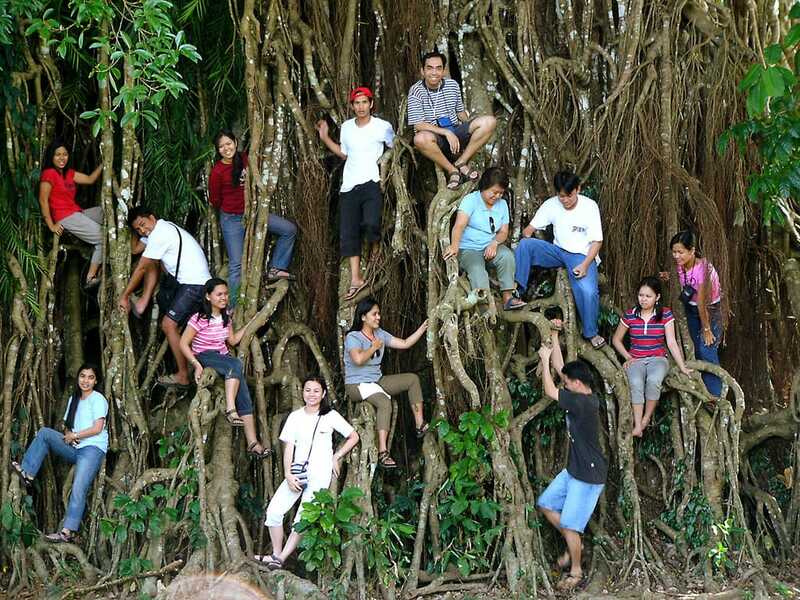 World Heritage Nomination – IUCN Technical Evaluation St. Paul Subterranean River National Park (Philippines). Antonio de Vivo, Leonardo Piccini, Marco Mecchia, Recent Explorations in the St. Paul Karst (Palawan, Phillipines). Proceedings of XV International Congress of Speleology, Kerville, Texas, USA. 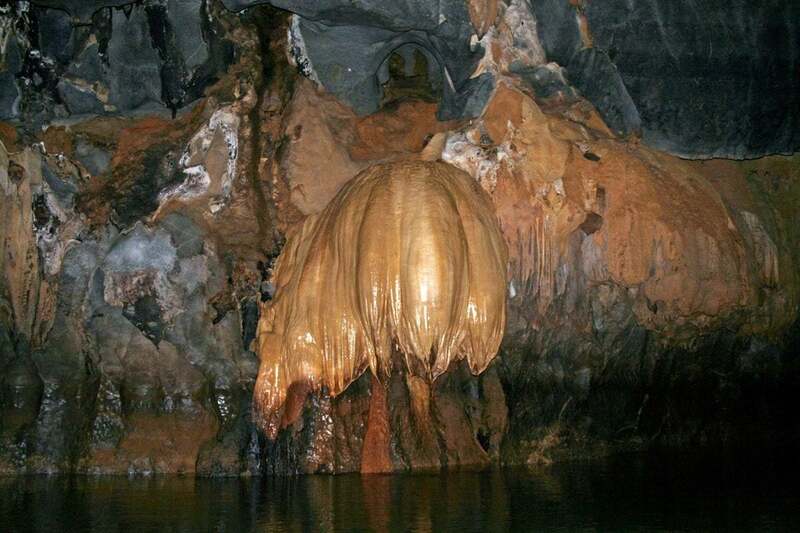 Puerto-Princesa Subterranean River National Park, Philippines, The Encyclopedia of Earth. Address: Asia, Philippines, Palawan, Puerto Princesa, Cabayugan barangay, some 50 km north of the city centre of Puerto Princesa at St. Paul Bay.